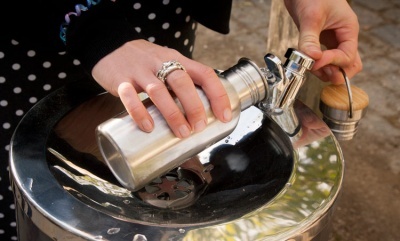 The move is the result of a partnership between environmental consultancy Eunomia, the Refill movement, Greater Manchester Combined Authority (GMCA), United Utilities and Bury Council, aiming to support greater investment in water fountains across the city, as well as in the Refill movement across the UK and beyond. The Refill movement, set up by Bristol campaign group City to Sea, seeks to tackle plastic pollution with a network of free-to-use water points, reducing the need for single-use plastic bottles. Its mission is to prevent the 7.7 billion plastic drinking bottles that end up being thrown away every year in the UK from entering the environment. Refill has been rapidly gaining momentum, with Refill projects being set up in towns and cities across the UK such as Bristol, Bath, Banbury, Cardiff and London. At the unveiling of the new fountains in Bury on Friday (22 March), Eunomia called for greater investment in free public drinking water facilities in order to prevent plastic pollution caused by single-use plastic bottles. The financial support provided by Eunomia for the two fountains in Bury comes from the consultancy’s carbon fund – money set aside to offset the carbon emissions the company produces though its daily operations. Mark Hilton, Head of Eunomia’s Manchester office, said: “We have used our carbon fund to sponsor the two newest additions to Manchester’s network of Refill Stations, and we sincerely hope that, as the number of community water fountains increases, it will become easier for the public to choose a reusable option rather than contributing to plastic pollution with single use plastic. The two fountains to be installed in Bury will be the first in a growing network of free refilling stations across the North West from fountains to cafes, restaurants and other businesses across the region. These refilling points can located using the Refill app and identified by prominent window stickers in the participating businesses. Councillor Alex Ganotis is GMCA Lead on the Green City Region plans launched in mid-2018 to make Manchester one of the greenest cities in the UK. He explained: “The launch of the Refill pilot in Bury is part of a growing range of initiatives across Greater Manchester to help reduce the amount of single-use plastics we use every day. Schemes like Refill are making a big difference, making it easier for people to use refillable bottles, cutting down the amount of plastic waste that ends up as litter and harms our environment. You can find out more about Refill on the campaign’s website.